Phillip's sister is staying with us for a while; it's always nice having guests as we usually go exploring a lot more than usual. 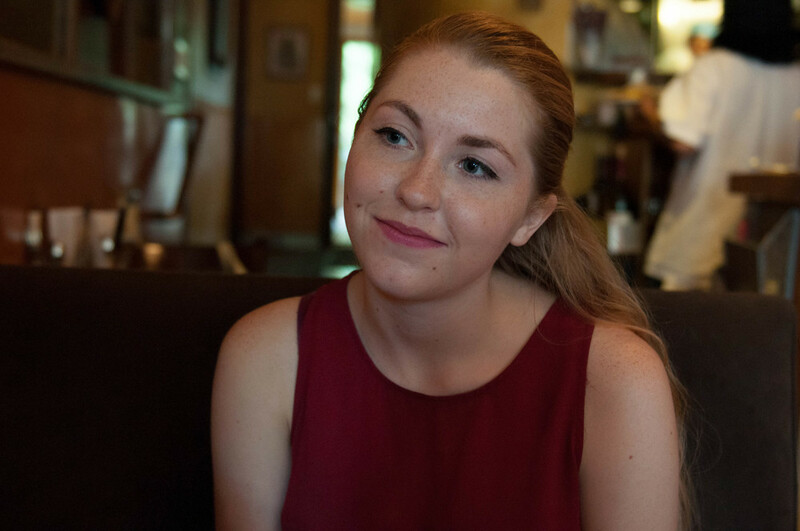 We have been showing her around town and this past weekend we spent a day in Red Hook. I love the area since it's so industrial and kind of gritty. Makes for good photo ops, especially if you're looking to shoot your next indie rock album cover. We also took a tour of the Widow Jane distillery/chocolate factory. We wanted to grab some lunch beforehand and our food took a little longer to come out than expected. Consequently, we shoveled the food into your mouths in six minutes flat and proceeded to run as fast as we could with full bellies to make it in time for the tour. What a trip. Inside the distillery is a courtyard with chickens running around. 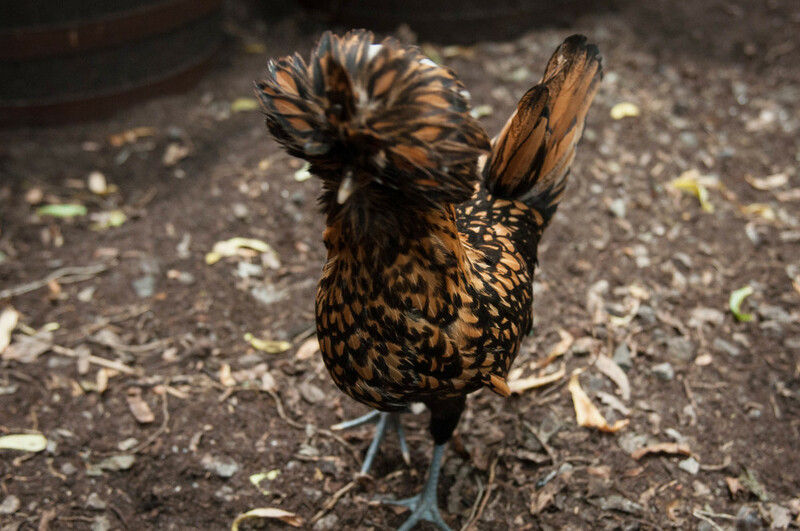 There was this one lady hen with crazy feathers. It made me want my own chickens, then they could lay eggs and I can use those eggs to bake cakes with. 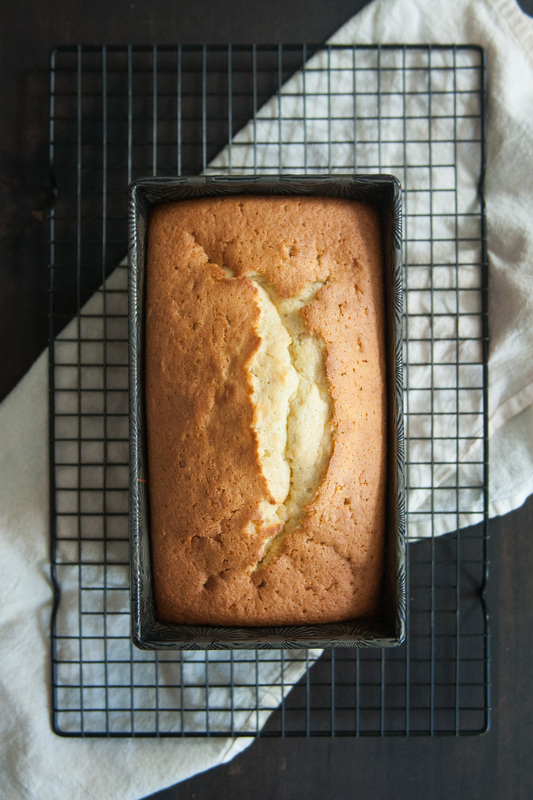 Now would probably be a good time to circle around to the point of this post: pound cake! 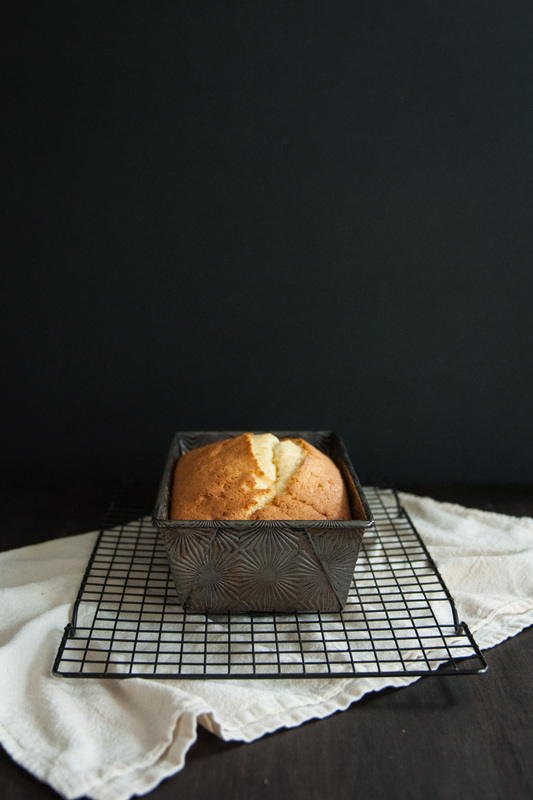 Originally getting its namesake for having one pound each of flour, butter, sugar, and eggs, pound cake is usually quite heavy, but I was looking for a way to lighten it up. I love the nuttiness of olive oil (it also doesn't hurt that it's healthier than butter), but when making the substitution, I had to find another way to incorporate air into the cake since creaming olive oil isn't really a thing. I found that some people separate eggs and whip the egg whites to stiff peaks then fold it in to the batter. It was the perfect solution. 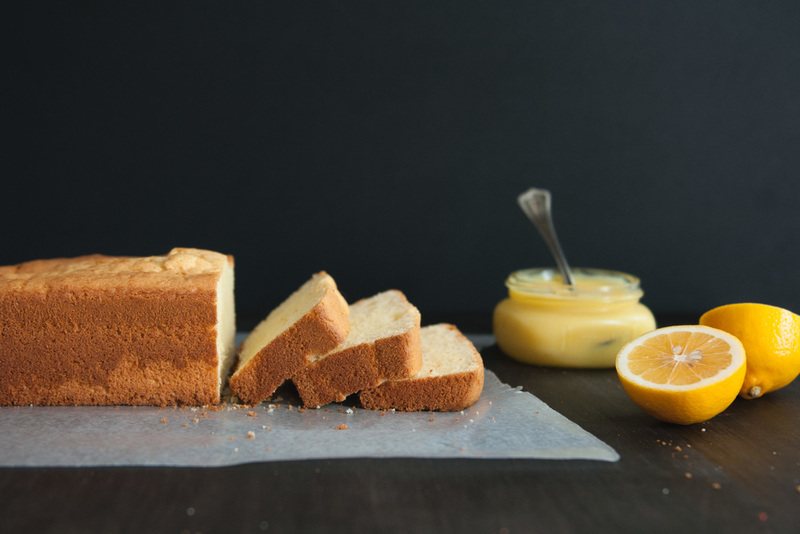 And because everything is better with citrus, what better to complement the cake with than lemon curd? If curd isn't your style, any jam, jelly, or ice cream would work wonderfully. The type of olive oil you choose to use (light, regular, extra virgin) is up to you. I personally prefer extra virgin, but it can be quite bold. Regardless, try to choose a high quality one, as many of the cheaper olive oils are cut with vegetable or canola oil. I like my lemon curd really lemony, you can add some additional sugar if you prefer it sweeter. Yields 1 pound cake and 1 & 1/2 cup lemon curd. Serves 8 to 10. Whisk lemon juice, lemon zest, sugar, salt, eggs, and butter in a small saucepan until well incorporated. Place the pan over medium low heat, whisking constantly for about 10 minutes until the mixture thickens, this will happen right before it starts simmering. It will be thick but still easily drizzle-able. Transfer to a jar, seal, and refrigerate for at least an hour. It will continue to thicken as it cools. In a large mixing bowl, combine flour, baking powder, and salt. Whisk to incorporate. 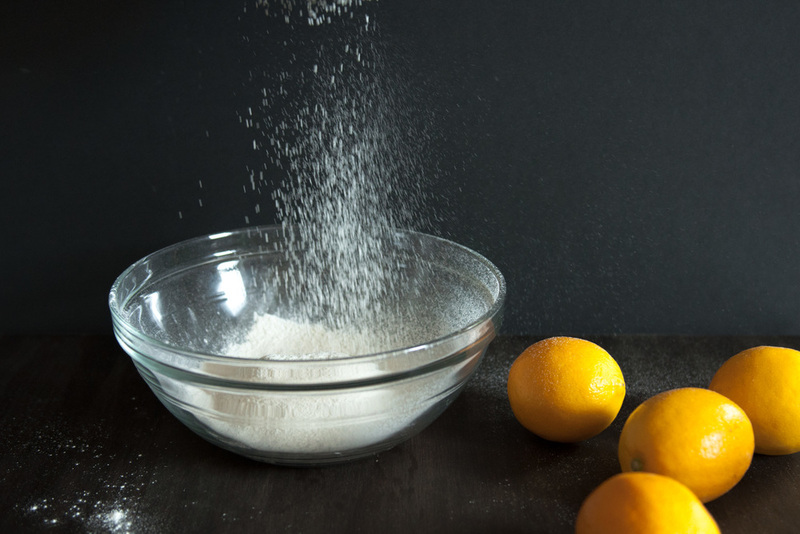 In the bowl of a stand mixer, beat sugar and egg yolks with the paddle attachment for 1 minute. Slowly drizzle in olive oil and mix for one more minute until smooth. In a liquid measuring cup, combine milk, vanilla, and brandy. Add half of the dry ingredients to oil/sugar mixture and beat for 1 minute. Add half of the wet ingredients and beat. Add the remaining dry and wet ingredients in the same fashion. Transfer batter to the large mixing bowl from earlier (it's fine if it has some residual flour on it, the less dishes the better!). Clean the bowl of the stand mixer and add egg whites and cream of tartar, if using. With a clean whisk attachment, whisk the egg whites to stiff peaks, but don't over-whip or it will start turning grainy and liquefying again. Add the egg whites to the rest of the batter and gently fold in. Transfer to a loaf pan that is buttered on the bottom but not the sides (most cakes with whipped egg whites will shrink a little when they cool, not buttering the sides will help the cake from shrinking too much as it has something to cling to) and bake for 50 to 55 minutes or until a toothpick inserted in the center comes out clean. After removing from oven, let cool in the pan for 10 minutes. Run a knife around the sides, gently flip the pan, and slide the cake out. Let cool on a wire rack. Cut into slices, top with lemon curd and enjoy.